Actually the cowboy image looks fine - adds to the theme. What about a little texture for the gulf's water. if this map has a frontier type feel to it, the airports are out of place. mibi wrote: if this map has a frontier type feel to it, the airports are out of place. Could you use train stations or truck stops? But then again Texas is also modern - SW Airlines got started at Luv Field, right. Good point! I will keep it in mind! Maybe a trian will work? Witch map is better Map 4 or Map 5? rgbubba...this poll should have been pulled down ages ago since it was onyl a ten day poll. Apologies from the Foundry for this. Regarding your map, could post an update on this page or thereabouts please of your latest map, as we like to be able to follow the versions thro-ugh the thread if possible to see what posters are referring to without having to troll back to page 1 all the time. On the transport issue, as trains have been used on a couple of maps now, and there is nothing to say you can't use trains, please give some thought to finding some wagon trails for instance that go with the era/style of your Pioneer? themed map, if i understand it correctly. mibi made a good point above. Also, have you got a small version available as i believe this is the large version, yes? BTW "Witch map..." should be Which map..., otherwise your map might just take off on Halloween. Just a little humour. 1. rgbubba...this poll should have been pulled down ages ago since it was onyl a ten day poll. Apologies from the Foundry for this. 2. Regarding your map, could post an update on this page or thereabouts please of your latest map, as we like to be able to follow the versions thro-ugh the thread if possible to see what posters are referring to without having to troll back to page 1 all the time. 3. On the transport issue, as trains have been used on a couple of maps now, and there is nothing to say you can't use trains, please give some thought to finding some wagon trails for instance that go with the era/style of your Pioneer? themed map, if i understand it correctly. 4.Also, have you got a small version available as i believe this is the large version, yes? 1. I don't know how to pull the poll off. 2. I tryed doing that but somone said to place it at the front. I can understand that would be a good thing to do. I have a problem I don't have all the tools to complete the map at this time. I would love to finish it as soon as I can. 3. Wagons sounds like a better choice. I will start the drawing concept. Do you know the code for xml. I will finish the map if you can help me with the code. 4. I need to know the size needed for small and large picture. And what you guys use to deturmend the X&Y. Does this look better for the time? 1. rgbubba...this poll should have been pulled down ages ago since it was only a ten day poll. Apologies from the Foundry for this. 2. Regarding your map, could post an update on this page or thereabouts please of your latest map, as we like to be able to follow the versions through the thread if possible to see what posters are referring to without having to troll back to page 1 all the time. That's OK, I'm sorry if i gave you the impression it was your job, it is not, Mods get to pull the polls down for you when they are finished. Not an issue. 2. I tried doing that but someone said to place it at the front. I can understand that would be a good thing to do. Yes, there are two ways of doing it: placing all the versions on the front page means that you end up downloading all the maps which is a lot of bytage when u have to view the latest version. It is probably better to post the latest version on the front page, and also post the latest version as you a re going along in the thread making comments, that way everyone can follow you. I myself try to post at least one version on each page for people to look at so they don't have to troll back. I can understand wanting to finish it soon, and look, you might not be far away depending on how much more you want to put on the map. I wouldn't do too much more as it is getting busy and that might spoil the artwork you already have there. Take your time and work methodically as this will put you in good stead for future maps if you take on others. I like the wagon wheels better, although i am not sure about the concept of them being able to attack each other through mid air. Perhaps others will have comment on this...maybe try a dirt "smudge" like track from one wheel to other to represent the pioneer trails, see how this looks if you like it. Suggestion only. Yes the xml will not be difficult for this map. See if there is someone who can assist you for this....perhaps contact HighCommander540 as he is always looking for xml to code. If you want to tackle the xml yourself, here is a tutorial from lackattack. Please check the How To Make A Map section for the map sizes you can work within. The x & y coordinates are the centre of your army circles. If you don't understand this, get someone who can assist you with the xml and perhaps they can doo all that for you. It is recommended that your army circles for the small map are 22pixels wide by high, and 24 for the large map. WidowMakers has an excellent tutorial HOw to Make Proper Army Cirlces also available. Your latest map is looking really very good, keep up the fine work! for future maps if you take on others. Thanks for your great suggestions. They were very helpful. I will put some ideas together for the wagon trail. Here are the Wagon Wheels Idea! Here are the WAGON WHEELS IDEA instead of the planes. What do you think? 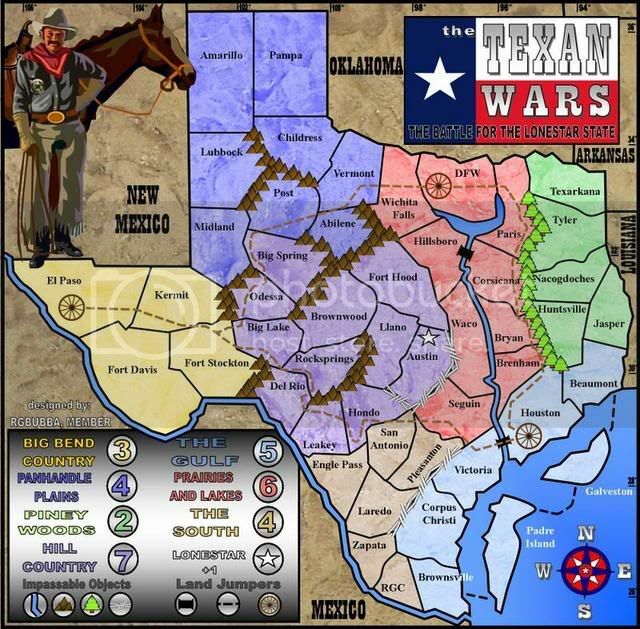 PLAN: You can fight the areas that have the wagon wheel with out having to go from state to state. You can fight from DFW to El Paso with out going threw the other states due to the trail is cut out for you. So with Houston to DFW, and Houston to El Paso. Nice trails rgbubba...are u certain that poeple will understand that Houston can attack El Paso when there is no trail there, even though you've called them Land Jumpers in the legend? Also, i think the removal of trees in Piney Woods from Texarkama to Paris would open up the gameplay a little, and also the mountains in Big Bend Country from Kermit to Midland. Just a suggestion. Both those continents are very insular and gives them an unfair advantage compared to other continents. If you do this, please adjust the bonuses if needed. What do others think about this gameplay? I don't want it to look to much, but if it has to be done I'll do it. Also I had already made plans to change the tree line. Thanks for the input! It show me im on the right track. Looking to finish this weekend. Maybe be a finial forge. I opened a path to the north in to piney woods, took some wire out at zapata and vitoria, then took out some hills in midland and kermit. You know I keep forgetting to add you to news post. Sorry about that. 640 wide is too big for the small map though. Sorry no one has told you that before now. You need to lose 10 px somehow. Coleman wrote: You know I keep forgetting to add you to news post. Sorry about that. yep as coleman said you need to shave 10 px from the width and in adition 29 px from the height. also don't be expecting final forge without both versions small and large. also you need to add some army circles because the army numbers will ve very hard to see on your current color scheme. also here are some more thoughts. * the lone star should start as neutral. and instead of that simple white star make it a shiny golden sherrif badge. * add in the legend that the wheels can attack eachother. * the trees and mountains look too, i don't know how to explain this but the copy paste of the same object is very visible. make dfferent shapes for the mountains and add different trees. * is the cowboy an image from the internet? if it is perhaps you should check for copyright. Does Pleasanton connect to victoria since theres a small opening that makes them look like they border eachother. Thanks I did not think about that! I need an Idea for that dead zone. Coleman wrote: 640 wide is too big for the small map though. Sorry no one has told you that before now. You need to lose 10 px somehow. What are the sizes I need? unriggable wrote: Does Pleasanton connect to victoria since theres a small opening that makes them look like they border eachother. Thanks it's my bad I was ajusting it and forgot to put it back, thanks. The large is fine (800 * 789 I think...); the small just isn't small enough.